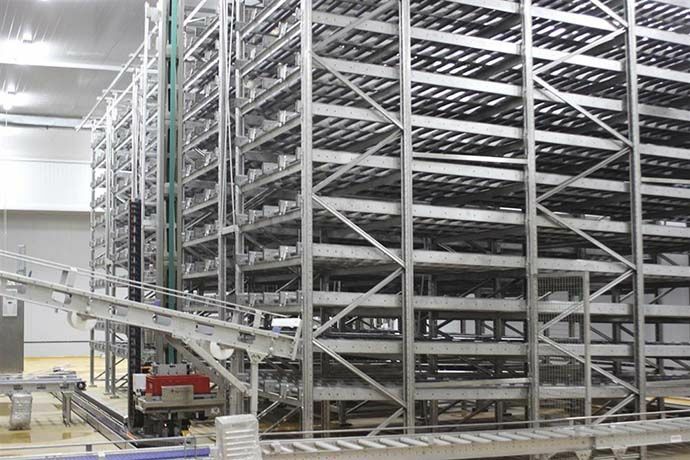 Warehouse racking system for full crates and pallets can be gravitational, pick and place or fully automated. For production areas with limited deposit place, gravitational systems are the best choice. Items move along the roller with help of gravitation and follow FIFO method. Gravitational warehouse offers two options: semi-robotized gravity flow and gravity flow shelving model. Semi robotized option allows robotized unloading and loading of full crates and pallets which can be stacked up to 6 meters in height and 30 meters in length. This model can be fully customized to client's requirements and is monitored with barcode system. Second model which is gravity flow shelving model, demands manual retrieval and deposit of full pallets and euro crates up to five levels. This model is suitable for warehouse with enough space for product picking and weighing, but it has small capacity. 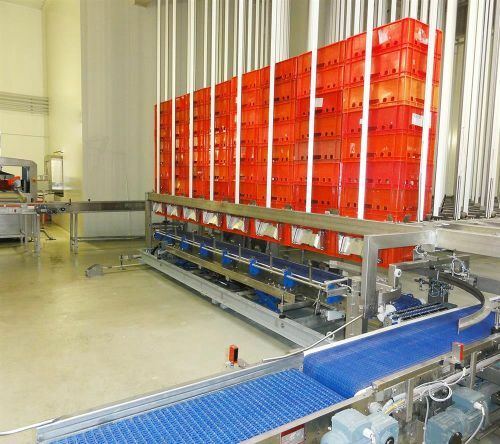 Pick and place storage racking systems use robots for transportation of full pallets and euro crates. They are designed for small capacity warehouse with heavy duty loads. Robots transport items from one place to their designated location on rack. Loads are traceable by RFID system which serves as a stock control. Pick and place system solves ergonomic solutions, increases efficiency and reduces operating costs. At the same time, it provides high level of hygiene according to HACCP, NSF and IFS strict standards. Automated warehouse system is the best solution for various production areas which have substantial deposit needs. It has multiple entry and exit points which are monitored with barcode tracking. Simple and accurate order picking of items follows FIFO inventory management. System also provides simple product traceability and accurate stock control. Maximum space utilization is ensured with compact and robust stainless-steel rack which requires minimal maintenance. Experts at Nieros help to design and implement optimal solution for warehouse process which is made according to production needs and expectations of client. Warehouse management systems provide all-inclusive entering, deposit and order picking solutions which simplify warehouse processes. They provide quick and easy deposit of full or empty euro stacking containers, euro pallets, plastic crates while managing order integrity with reliable and accurate inventory control. Nieros is aware of importance of economical use of time and space, therefore all warehouse facilities follow firt in, firt out (FIFO) method. With FIFO method, maximum product quality in ensured. Customized solutions and expert advice help client to organize their deposit space. Stored items have to be traceable and accessible anytime. Warehouse management systems can be operated automatically or manually, they are user friendly, ergonomic in design and promote various work tasks in order to increase productivity. Carefully planned and organized depository with state-of-the-art technology, is easy to clean which means hygiene conditions are significantly improved. Automated material handling system has been designed for different industries. Because of their modular design, they can easily be integrated with Nieros industrial washing or hygiene units. Robotized transport systems enable optimized material flow with transporting and managing cargo along production line. Systems can be horizontal or vertical. Nieros produces two types of transporters: one is for managing various items like pallets, crates, boxes and the other type is designed for managing other products. Designed to ensure maximum profit with minimum labour, they provide better comfort, simplify work and productivity is increased. Systems are modular which means they can be integrated in Nieros products. Nieros produces two types of transporters: for items like crates, boxes, pallets and for managing other products. Product transporters are developed for handling meat, fruit, vegetables and other raw material or packed products.